(i) Interface characterization and engineering of high-performance metal matrix (nano)composites, (ii) characterization and microstructural studies in relation with macroscopic properties by transmission electron microscopy ((HR)TEM, ACOM, SAED, CBED, PED...). Sabrina MACALUSO, Interfaces dans Al / TiB2 / Mg(Zn,Cu)2 : étude atomique, influence sur les morphologies et propriétés. Thesis started in 2018. Other co-advisors: Rémy BESSON, Ludovic THUINET. Run XU, On the study of strengthening mechanisms of the bioinspired MWCNT/Al nanocomposites . Thesis started in 2017. Other co-advisor: LI Zhiqiang. Xinliang XIE, Fabrication additive par projection à froid et caractérisation de matériaux composites nanotubes de carbon/Al . Thesis started in 2016. 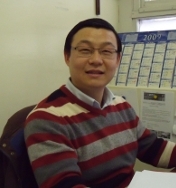 Other co-advisor: LIAO Hanlin. Yu MA, Microstructure and interfacial Characterization of TiB2/Al nanocomposites with unusual tensile ductility. Thesis started in 2016. Other co-advisor: Vincent JI . SHEN Zhengyan, Fabrication, using semi-liquid continuous process, and characterization of composite metal matrix materials using graphite flakes as reinforcement and metallic (Al and Cu) flakes as matrix . Thesis started in 2016. Other co-advisor: Silvain Jean François. Devadas BHAT PANEMANGALORE, Engineered surfaces based on magnesium alloys and composites . Thesis defended in 2019. Other co-advisor: Rajashekhara SHABADI. 37 oral presentation(s), including 8 invited. 7 poster(s). Detailled list.